Da Vinci Bellagio Yellow/Blue Narrow Regular Index Playing Cards with our low prices are some of the world's highest quality playing cards. Da Vinci cards are designed and manufactured in Italy using the finest plastic and are comparable or better than both KEM or Copag cards and at a considerable cost savings over KEM cards. These cards are thicker like the original KEM cards. 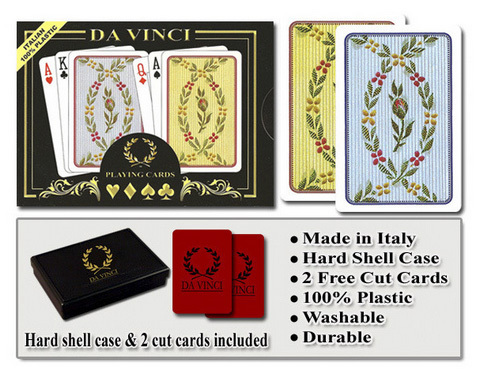 Da Vinci playing cards will not scratch, tear, or crease under normal playing conditions since they are made of plastic instead of paper. Completely washable, you don't need to worry about soiled cards. A quick wipe with a damp wash cloth, then dry, and they are ready to go. A properly cared for deck will last for years and years! Da Vinci cards also come with a life-time replacement warranty for defects or damaged/missing cards. This 2 deck set-up consists of one yellow deck and one blue deck. The cards come in a durable plastic card tray.